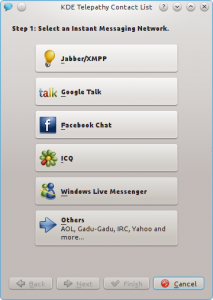 What does KDE offer for instant communication with your co-workers and friends? Kopete steps up to be your all-in-one IM solution. 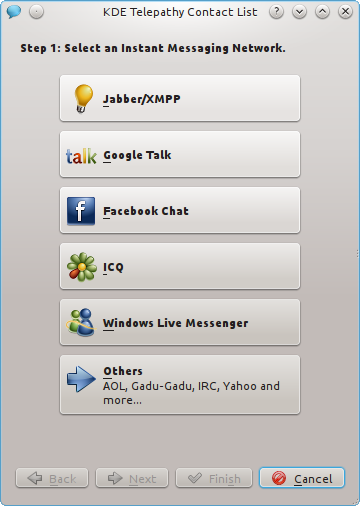 Kopete provides a KDE integrated instant messaging experience that aims at reducing the number of other instant messaging clients you need to run simultaneously in order to stay in touch with your friends. 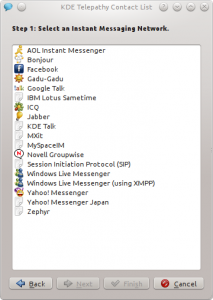 Rather than running a client for Yahoo Messenger, Facebook chat and Windows Live Messenger, you can instead fire up Kopete, add all of your accounts and take advantage of a single unified interface for all of them. This drastically reduces the on-screen clutter. Kopete supports a lot of different networks! The process by which you actually configure all of these accounts is also very straight forward. In fact the first time you start Kopete up (and every time thereafter that you wish to add a new account) you get this nice little interface that helps walk you through the process. Once through that easy process you are taken to the main Kopete interface screen where it allows you to view your online friends and, of course, chat with them. Not that it should come as any surprise to anyone familiar with KDE but Kopete also supports quite a bit of customization. You can adjust any of the standard settings that you would expect (i.e. auto-away time out, ‘now playing…’ song statuses, etc.) as well as the general look and feel of your conversations. While I don’t have much bad to say about Kopete I should point out a couple of its more obvious deficiencies. For one Kopete has no Skype support. Skype is fast becoming one of the most popular instant messaging platforms and its absence is a bit disappointing. 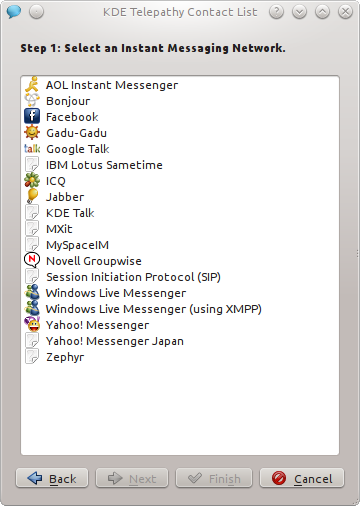 Secondly Kopete varies from being just an acceptable, somewhat decent instant messaging client to being a great instant messaging client, all dependant on which IM network you are using. What I mean by this is basically that Kopete is designed to be a very generic IM client in order to support as many networks as possible, and that’s fine. However because of this design choice it rarely excels at being the best IM client for networks which handle more than just simple text messages. There are many times when the official client for a given IM network will support many more features than Kopete. Neither of these should deter you from using Kopete (or at least giving it a try). Like all of the other applications I’ve written about in this series, Kopete offers a KDE feeling and integration to your day-to-day applications and for some people that could be far more worth while than having 100% of all features. 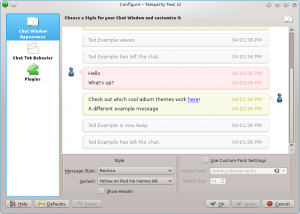 Update: as pointed out in the comments this application is actually now known by the name KDE Telepathy. Sorry for the confusion. 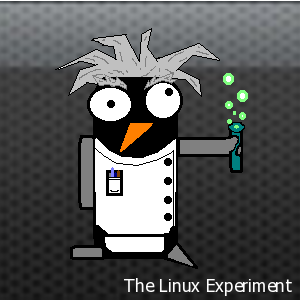 Thats *not* Kopete, but KDE Telepathy. Kopete it’s been dead for some time now, KDE Telepathy is it’s sucessor when in comes to IM in KDE. Not that you can’t install and use Kopete nowadays, it’s still packaged and functional, albeit a bit old..
As for Skype support… there’s no reverse-engineered protocol for Skype yet (that i know of), so i’m afraid you will not see alternative Skype clients anytime soon. Anyways, KDE Telepathy has evolved very quickly in the last year (from almost nothing to what you’ve shown, not bad), but it has one shortcoming for a long-time Pidgin user like me: no IRC support (yet). Ah so it is, I stand corrected. I guess I’m still used to the older versions of KDE. Thank you for the correction.